As summer approaches, many children are counting down the days until school ends and camp begins. Summer camp is not just a fun break from school, but it can be a crucial time in a child’s social development. For that reason, it is an experience from which no child should be excluded. Fortunately, our region offers a number of summer camps for children with special needs. Camp Kon-o-Kwee Spencer, operated by the YMCA, sits on 500 beautiful acres in Fombell, PA. The Y partners with a wide range of different organizations, such as the National Hemophilia Foundation, the Muscular Dystrophy Association, Children’s Hospital of Pittsburgh’s Heart Camp as well as Camp Star, a camp for amputees, to offer children with these issues a chance to experience a real camp with other children who are in their same situations. “All of our traditional activities are open and available for these groups. We have archery, rock climbing, zip lining, arts and crafts, an obstacle course and swimming. 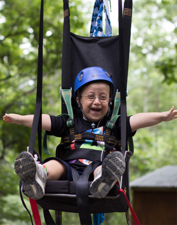 We do adaptive programming for the needs and limitations of the campers,” explained Executive Director Zach Hoffman. The camps are typically one week long, and all of the activities are delivered with certain core values such as honesty, caring and responsibility, as well as resiliency and problem-solving. “For special needs campers, these character values are important to experience and share,” said Hoffman. The grounds, lodging and facilities are physically accessible, and the camp provides a top-notch medical center. Sometimes former campers come back to work as counselors, serving as role models to the current campers. The Woodlands in Wexford sits on 52 acres and is a resort-style camp that caters to people of all ages who are living with disabilities and chronic illnesses. A sports court, archery range, zip line, and therapeutic pool are just some of the offerings at the Woodlands, which is also a year-round facility. “There are a lot of different facilities to cater toward the strengths, interests and goals that campers want to reach,” said Solomon. The fact that many kids come year-round to the Woodlands leads to sustainable friendships as well. Solomon added that they cater to all disabilities, including those that are intellectual, physical and developmental. “We’re very inclusive because we can meet the needs of all individuals with different disabilities in the same environment,” she said. Quest Therapeutic Camp caters to kids who are “on the fringes,” said Director April Artz. While most of these children may ‘look’ typical and are in public schools, they may have trouble fitting in socially—some have ADHD, anxiety or impulse control issues; some may not have a specific diagnosis. The seven-week day camp is held at Community Day School in Squirrel Hill and serves ages 6-18; campers are encouraged to sign up for at least three consecutive weeks. “The goal is for them to come to a camp in the summer, feel successful, feel good about themselves, and also learn new skills so that when they leave at the end of summer and go back to school, they’ve gained skills,” said Artz. Like the other camps, the campers engage in typical summer camp activities, including field trips and swimming. Campers are screened before camp begins and they, along with their parents and Artz, set individual goals for themselves; each day they get feedback and positive reinforcement about how they are faring. They also receive group therapy each day. 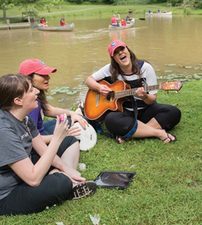 If summer camp is key to growth and development for all kids, it can be transformative for those with special needs.